The newly announced National Shipbuilding Strategy (NSbS) sets out the steps the British government will take in regard to the industry and its own procurement policies to affordably grow its frigate and destroyer fleet, currently at 19 ships, in the coming years. The NSbS is the British government’s response – and endorsement – of Sir John Parker’s recommendations in 2016 for reorienting the British shipbuilding industry to be internationally competitive and supportive of domestic employment and technology innovation growth. Cost overruns had required London to trim envisaged Type 45 destroyer and Type 26 frigate procurement to six (from 12) and eight ships (from 13), respectively. However, the current force plan requires the Royal Navy to maintain a surface fleet that is smaller than what it requires to support British naval interests. 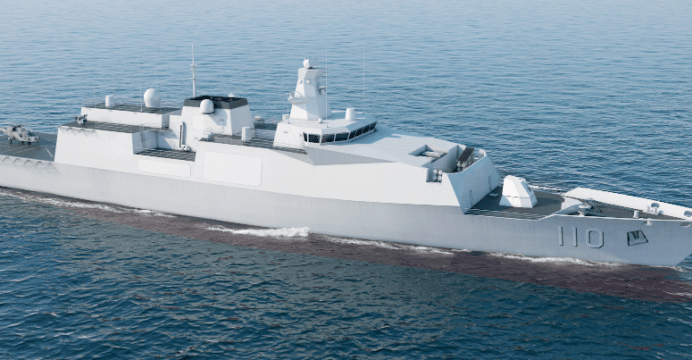 To affordably close the quantitative gap, the UK set the NSbS to produce a markedly lower-cost frigate – designated Type 31e – through a revised industry engagement strategy, one that realizes both Royal Navy requirements and those of the overseas market. The Type 31e is to replace the Type 23 frigate. With a target commissioning date for 2023, the NSbS has set the Type 31e frigate’s price at £250 million, which is $327.5 million U.S. The UK hopes that the attractive baseline price will position the Type 31e as an attractive option for prospective overseas buyers, especially those with tighter fiscal limitations. BMT and Babcock are the leading candidates for securing the Type 31e design contract (Shephard Media). BMT has been marketing its 4,000-ton Venator-110 frigate design for Colombia’s Plataforma Estratégica de Superficie (PES) bid. BMT’s PES proposal shows the Venator-110 fitted with sensors and armaments from Saab and MBDA, highlighting its customizable and client-driven architecture. The NSbS aims to return the British shipbuilding industry as a viable competitor in the global naval market, which itself is going through notable changes, including the entry of emergent shipbuilders from Asia. The main contributor – and conversely, the inhibitor – to that competitor growth has been the high costs of ship design and manufacturing in the West, including the U.K.
With the aim of controlling cost and increasing competitiveness, especially in light of the price cap set on the Type 31e frigate, the U.K. Ministry of Defence (MoD) is pushing to change the consolidated production and assembly model (used by BAE Systems) to a distributed model wherein different parts of the ship (i.e. modules) are constructed in different locations prior to final assembly. Naval and commercial shipyards will compete and be awarded contracts based on cost and efficiency. However, analysts are not convinced of the tenability of the NSbS. A recent report by the Financial Times (subscription required) shows that although the theory of distributing naval production across many efficient vendors is desirable, Britain’s limited domestic needs provide limited economies-of-scale for these manufacturers. With few production units amortizing research and development (R&D) overheads, British products have high prices. These challenges have pushed France, Italy and even Britain (before the NSbS) to push for sole-sourcing naval equipment. It is unclear how new and/or smaller naval vendors will cope with managing their respective R&D overheads with the MoD’s pricing cap. Moreover, the NSbS also warned of higher integration costs (e.g. from transporting modules) in a distributed build model. In a sense, the low pricing promise is tied to how well the U.K. does in securing overseas Type 31e sales. The NSbS envisages a market of 40 light frigates in the next decade. Besides competitive pricing, support mechanisms such as export credit, flexible customization options (especially in integrating non-British subsystems and armaments) and possibly co-production will be vital to the Type 31e’s competitiveness.